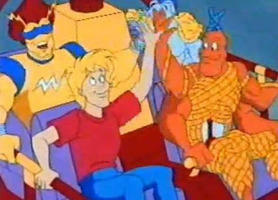 I need help identifying old cartoon from my youth. It has been unbearable itch for me for quite some time. Main characters: Humanoid beetles (not sure about the beetles thing). I think there were three of them. One of them had power over ropes and I believe he was made of ropes. He was a jolly comic fellow. Another character I remember was humanoid with power over metal rings. Rings were in diameter close to the diameter of a manhole. I believe the rings were integral part of his body. The ring guy was a leader figure. Both of them – the rope character and ring character were male but non-human. Plot: don't remember any details. I think the plot involved a group of beetles being exposed to the chemicals and becoming humanoids in similar fashion to the teenage mutant ninja turtles. There was a villain as well. Somewhere during the series run the beetles got upgraded – got power boost and changed their colors. The fourth member of the team joined as well. 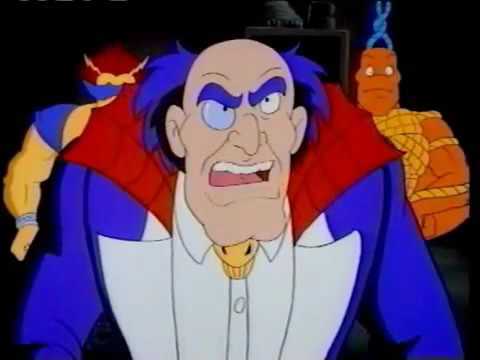 The villain: Elderly man probably a mad scientist but dressed up in Dracula style robe. He was bald with leftovers of his hair near his ears. I believe he occasionally wore monocle and had a magical walking stick (not sure about monocle even less sure about the stick). I think he had a bow-tie with spider pattern, but not sure about this. Runtime: 90s or early 2000s on one of the kids channels (more 4kids than jetix). I am from Europe but I think the cartoon was American. Artstyle: American, not anime. There was a Halloween feel to the series. Not comic book based – not marvel, not DC. Anyway not popular comic book. I tried finding it with google and wikipeda but couldn't find it. Your desciption sounds a lot like Creepy Crawlers, a 1994 cartoon that was inspired by a toy of the same name. The Creepy Crawlers TV Show was based on ToyMax's Creepy Crawlers Activity toy. The show is about Chris Carter, a self-described "normal kid" who is interested in magic. While working at the Magic Shop of bitter discredited stage illusionist Professor Googengrime, Chris designed and built a device he called "The Magic Maker", ostensibly for use in some unspecified magic trick. A particular once-every-thousand-years planetary alignment, the Magical Millennium Moment, rained down cosmic energies on the shop one fateful night, which somehow made the Magic Maker capable of creating strange, man-sized bug/magic trick composite mutant creatures. The three creatures formed that night, Hocus Locust, Volt Jolt and T-3 (dubbed "Goop-Mandos" by Googengrime), despite looking bizarre, turned out to be friendly, and joined forces with Chris, but Googengrime kept the Magic Maker when Chris and the Goop-Mandos escaped from the shop. Each episode thereafter concerned Googengrime's latest attempt to gain power and conquer the world with a Magic Maker-created "Crime Grime" monster, and Chris and The Goop-Mandos' efforts to stop him, and retrieve the Magic Maker from his evil clutches. As the series went on, more Goop-Mandos were created. In addition, a young girl named "Sammy" Reynolds became a close ally of the group.